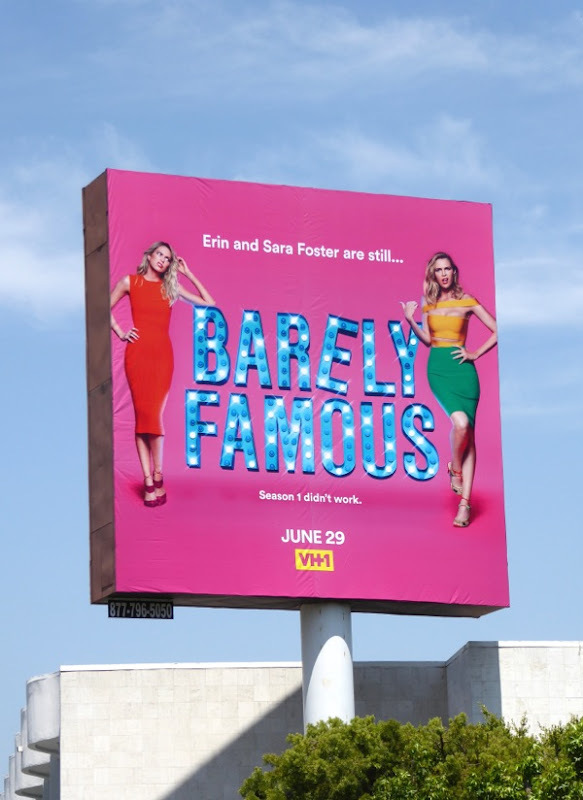 The cult of celebrity and world of reality TV is rife with comedic potential, so much so that this March sisters Sara and Erin Foster plan to poke fun at Hollywood stereotypes and 'unscripted' fly-on-the-wall shows with their new mockumentary series, Barely Famous. 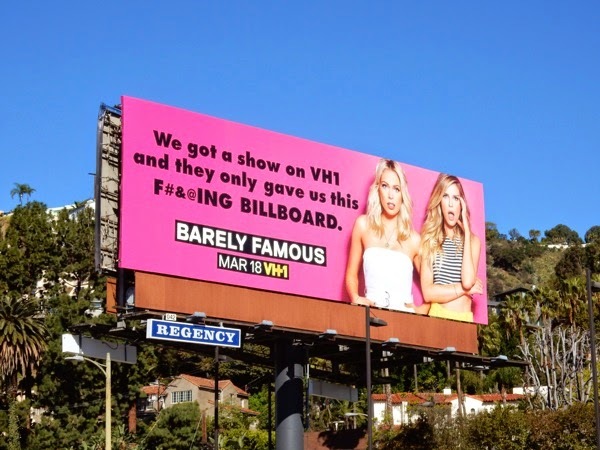 And for their troubles VH1 only gave them this f#&@ing billboard, WTF! The faux docu-style show will follow the actress and writer sister duo as they mingle with their celebrity pals and try desperately to get on the A-List, even if they profess to not be interested in being there at all. 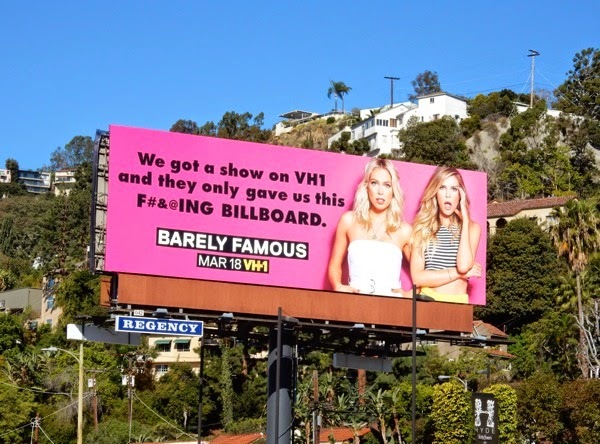 Daily Billboard always loves when advertisers play with the billboard medium in their ad creatives, and this fun, bright pink creative certainly catches your attention and was spotted along Sunset Boulevard in West Hollywood on March 4, 2015. Let's hope Barely Famous provides some witty satire and isn't simply as shallow, one-dimensional and self-obsessed as the culture it is trying to mock. UPDATED: Barely Famous is back for a second season, because in their words 'season 1 didn't work'. 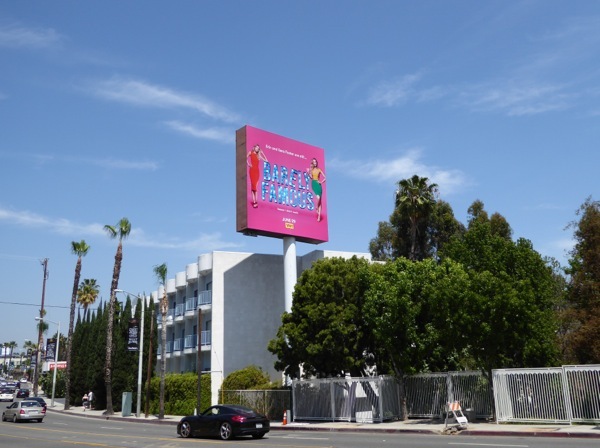 You can't help but see the clueless Foster sisters on this hot pink billboard with their show's name lit up in showbiz lights along the Sunset Strip on June 6, 2016.